The retro-inspired 500 will be many Americans' first exposure to Fiat cars. TOLUCA, Mexico (Reuters) – A Mexican factory could produce up to 130,000 Fiat 500s a year, helping the recovery of Chrysler in the United States, Fiat S.p.A. CEO Sergio Marchionne said. A Chrysler plant outside Mexico City will begin assembling the 500 by December for sale in U.S. and Latin American showrooms, said Marchionne, who also heads Chrysler. 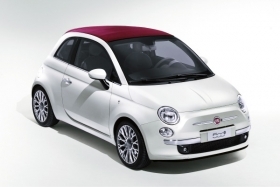 The retro-inspired 500 will be many Americans' first exposure to Fiat's cars and will be sold in Chrysler showrooms. Chrysler is struggling to rebuild trust among American consumers by revamping its aging, truck-heavy lineup through 2014, with a dozen new vehicles built on Fiat platforms. Marchionne's plan calls for Chrysler to break even on an operating basis in 2010 and on a net basis by 2011, in part by regaining market share lost in its slide toward bankruptcy. The $550 million Mexican investment by Chrysler will be mostly financed through a loan from Mexican development banks, Marchionne said. "The 500 is expected to stir excitement and certainly will help us position the group in the forefront of the industry in terms of innovation and fuel efficiency," he said at the plant in the city of Toluca. He added: "The 500 is just one example of how Fiat's experience in the small to medium vehicles segments and its expertise in fuel saving technologies will play a key role in Chrysler's revival." Marchionne did not give production details but said the 130,000 cars a year was a target, with sales going to both the United States and Latin America. "I don't think we are going to shrink American's tastes by introducing the Fiat 500. We are only looking for a particular space in the market for this car to occupy," he said. Fiat was given control of Chrysler by the Obama administration last June as part of a restructuring of the U.S. automaker in a government bankruptcy.